“While I was studying and observing some of the work of Henry Lindlahr, I did not fully appreciate the value of the healing crisis until I actually saw it working in my own practice. Also, you have to see the healing crisis work under your own care, watch it develop before your very eyes, to really value iris analysis. One of the first cases brought to me some years ago so impressed me that to this day the healing crisis is the most interesting part of my practice. The patient was a lady, of perhaps 65, who came into my office because she had two boils under one of her arms. She had been having them treated under what is known as orthodox medicine today. They had been lanced repeatedly over a period of years with no results. Remembering that disease is impossible in a clean body, I started a cleansing process, and in two months, these boils were eliminated and no others appeared. Approximately three months later, however, this lady broke out with two more boils on the breast. Upon questioning, I found she had had two boils on the breast two years before. This was my first lesson in the retracing of disease in that this was her first process to reappear, but these breast boils had been her last disease process treated before the boils appeared under the arm. In my striving for a “cure,” I had no particular treatment for the boils, other than that of cleansing the body. I made sure that the blood stream was purified and that all the blood necessary reached the parts affected. Within a very short time – a week or so – the boils cleared up completely. During this time I saw that the patient reduced her food intake and rested sufficiently. For about a month and a half this patient enjoyed average good health, but at the end of this time she came to my office assisted by two men, hardly able to walk. Her first remark was, “I have my old rheumatism back again – the same thing I had ten years ago. I thought I came here to get well, but now look at me!” I told her I had handled other cases successfully and felt I could do the same with her case through right living methods; that there was no reason why she should not carry on with right living habits as she was doing and see what would happen in the next few days. This crisis or elimination process lasted only three days. It was hard to believe that such a severe retracing process would occur, but after the third day this lady had no return of her rheumatism and was able to go about her work without any difficulty whatever. Is it possible for a person to have such extreme pains, such extreme discomfort, and yet have them leave so completely and suddenly? Sometimes the patient’s pain during the healing crisis is of greater severity than while he is building the chronic disease. I distinctly remember how happy she was in overcoming this problem. She came in to tell me how wonderful she felt and how spryly she could get about. This was not the end of the case, however. A month or month and a half later, the lady came in with a discharge from the ears. I did not mention above that she was suffering from deafness. I had accepted this merely as part of her old age. After about a week of this discharge from the ears, the patient recovered her hearing, and recovered it to such an extent that she was disturbed by the ticking of the clock in her bedroom at night. It kept her awake. This was the first time she had heard a clock in twenty years! 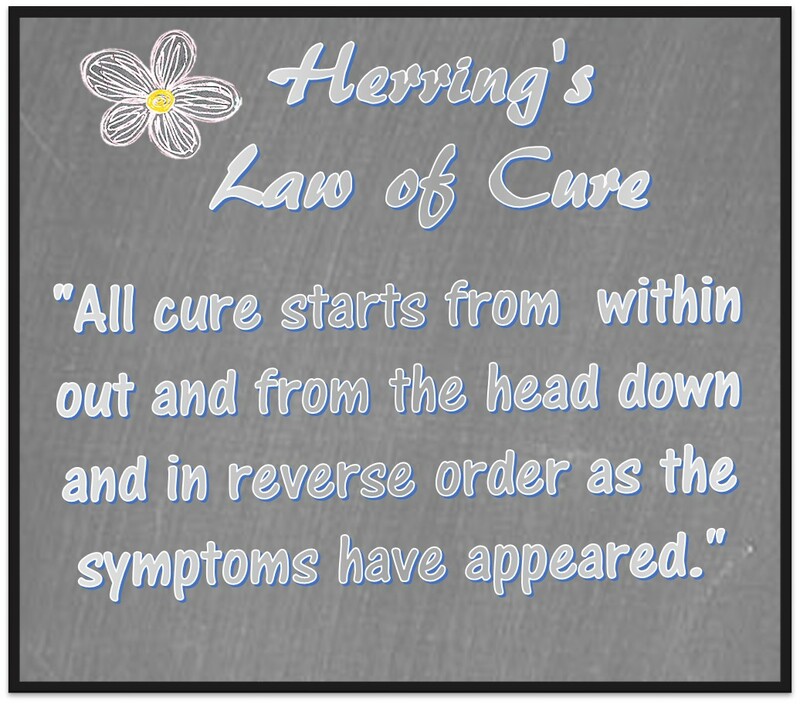 Viewing this case in the “order reversed”, as Herring puts it, we note that she had the first boil about two years previously, her rheumatism about ten years, then finally her deafness which began with a discharge about twenty years ago. I watched this internal law work perfectly in the body and I had the wonderful science of iridology to predict these crises as they were evidenced by certain color changes in the fibers of the iris. It is the body itself that has the make up and the materials that produce a crisis. This capacity is found in everyone. Anyone can have a crisis at any age, though the young person will have the crisis much more quickly than those of advanced years. It requires energy to have a crisis; it takes activity of blood cells, and power of tissue structure. It takes a reserve to go through a healing crisis, and the body will not produce a crisis unless it is able to go through with it. It is as natural a process as the sun rising in the morning, a Godly process. If you want a clean body and wish to get as close to a “cure” as possible, go through the healing crisis. It is difficult for the average person and for the average doctor to tell the difference between the healing crisis and a disease process. Though usually the manifestations are similar, a healing crisis is brought about through an accumulation of health in the body, and the active healing power carries the person through. It is difficult to accept the fact that a healing crisis comes right after a patient says, “I have never felt so well in my life.” This is the time you can usually expect the crisis and is the time when the crisis can do its best work. By: Bernard Jensen, D.C., N.D.